When people learn that I’ve guided in Alaska since 1984, I’m often asked “What’s different?” “What’s changed in the past thirty-five years?” The expected response, I suppose, would be some sort of campy Gabby Hayes routine. So, what’s changed in Alaska? The fishing is often much better, but it can be different than it was. Many Alaskan lodges fish popular rivers that are convenient for their operations, and this water really gets pounded. The resulting pressure often makes the resident fish much more difficult to catch than they used to be. In 1984, when I was a first-year guide on one of these rivers, my fly box held four patterns; a variety of marabou muddlers, a couple different colors and sizes of wooly worms (pre-wooly bugger), a few #10 royal Wulffs, and a couple of # 8 hare’s ear nymphs, which we swung like a streamer (pre-strike indicator). Everything was fished on 10-pound Maxima, or perhaps 8-pound if it was a bright day and I wanted to impress my fishermen with how savvy I was. The guides who work these rivers today have figured out how to catch the resulting smarter and cagier fish, often with small nymphs and dry flies, sometimes on 6x tippet. For the most part, particularly on these heavily fished rivers, the days of “no-brainer” fishing is over. The fishing can still be great, but it’s different than it was. It’s more challenging and in my opinion, much more interesting and rewarding. Flying in a floatplane means you’re fishing remote water – not so much any more. I used to believe that a remote Alaskan experience required flying in a floatplane. Today’s Alaska is a much busier place, and there are no more “secret spots”. The fact of the matter is; if your floatplane can land (unless it’s private and/or permitted water) then everyone else can too. There are some famous rivers that are so popular that nearby lodges will launch their planes before dawn in an attempt to arrive at first light and guarantee their fishermen a spot on the water. The fishing must be awfully good (if you can get it) because many clients return. I might be spoiled, but I’d rather catch fewer and smaller fish in a true wilderness setting. The idea of catching trophy fish while standing shoulder-to-shoulder with a bunch of other people has no appeal to me. But here’s the thing; it doesn’t have to be a choice. You can still find great fishing… without the crowd. If a wilderness experience is as important to you as the fish you catch, here’s what I recommend. Find a lodge that utilizes water inaccessible to float planes and other operators. Try a remote single-river lodge, where you fish by boat each day. Choose a lodge (fly-out or otherwise) that has a flexible fishing program. Some lodges are willing (even prefer) to customize each day’s fishing to meet their fishermen’s requests. This flexibility allows them to take you to more remote, out of the way locations. Given variable weather and other fisherman’s desires, you may not get exactly what you want each day, but you’ll get more of it. Select an operation that has access to private and/or permitted water. Some operations have remote water that they own, lease, or they have a permit to fish exclusively. Try to find any combination of the above. Alaskan guides are much better than they used to be. In the old days all you needed to be an Alaskan fishing guide was a wool buffalo-plaid shirt, a buck knife, and pulse. Today’s guides are licensed by the state, and this requires them to be a US Coast Guard Captain, trained and certified in CPR and First Aid, and many of them are graduates of highly respected guide schools. There’s also a good chance that he or she (that’s different too) is a serious professional who works as a guide all year. Generally speaking, today’s guides are better teachers and instructors than they used to be, and consequently the lodges that employ them are much more welcoming places for beginners or families. For the most part, today’s guides are very adept at assisting you on the water while keeping you safe. Chances are also good that they can prepare a gourmet shore lunch while telling stories or jokes that won’t embarrass your wife and children. Chances are that no matter where you go, the accommodations on your next fishing trip to Alaska will be much nicer than they used to be. To put it simply, fishermen’s expectations are higher than they were, and today’s fishing operations need to meet these expectations to stay competitive and survive. “Nice” doesn’t necessarily equivocate to “new”, however. One of my favorite fly-out lodges has a very distinctive and nostalgic feel. It’s clean, bright, and comfortable… and harkens back to a simpler time. Remember the old days, when the guides used scissor-jack lifts to run leaky boats up the river? Probably not, it’s been a long time! Most current operations take great pride in their equipment, and it’s rare to see outboards more than a few years old. While there’ll be an occasional breakdown… it’s not as common as it used to be. Not only do the lodges have better equipment… you do too! Gone are days of rubberized canvas waders that weighed thirty pounds and required a trip to the chiropractor upon your return. With modern Gortex material it’s easy to forget you’re even wearing waders and rain gear. Rods are lighter and stronger; reels are smoother and more dependable. Fly lines cast better and leader material is stronger. Everything is better: lighter, tougher, and more reliable. These days there are more flights into Anchorage, and once you’ve arrived, more lodging and dining options than ever before. Just as important, travel to remote villages is easier because of additional carriers and flights. Furthermore, many operations have incorporated chartered flights from Anchorage to their hub-villages where you’re met and shuttled to the lodge. This has been beneficial to everyone. The lodges that utilize charters have more dependable service and no lost baggage. It’s also relieved some of the pressure on the commercial carriers, which hopefully allows them to do a better job for everyone else. So, what’s changed in Alaska over the past 35 years? 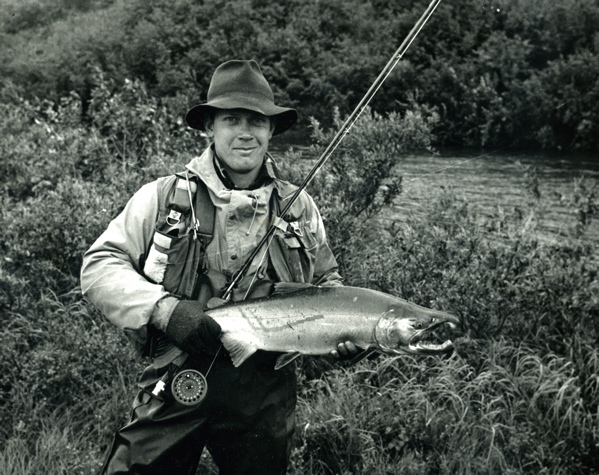 The fishing in Alaska is different than it was three decades ago… and as good as ever! You have many more options; fly-out lodges, single-river full service lodges, river camps, guided float trips. Interested in joining me on my next trip to Alaska? Visit my travel page to learn more about my upcoming hosted trips. I’m saving up for a bucket-list fishing trip in western Alaska. Can you give me the names of two or three single-river full service lodges that you would recommend so I can do a little research on prices and accommodations? Thanks! Good to be in touch. I certainly can recommend a single-river full-service lodge in Western Alaska. I recommend Alaska Trophy Adventures Lodge, on the Alagnak River. I host an annual week there, and would love to have you join me! Let me know if you have any questions, or if I can be helpful.